this is probably one of my favorite and most common looks these days. i go through phases of skirts and then phases of jeans randomly and most recently i've been loving all my boyfriend fit destroyed denim! since i'm still semi-boycotting maternity jeans, my loose boyfriend jeans have been the next best thing! these in particular are a favorite- joes are some of my favorite fitting jeans and so worth the splurge if you're looking for that perfect comfy, relaxed fit! also, don't forget to enter the inspired by tess giveaway here and the hobo clutch giveaway here before it ends monday! 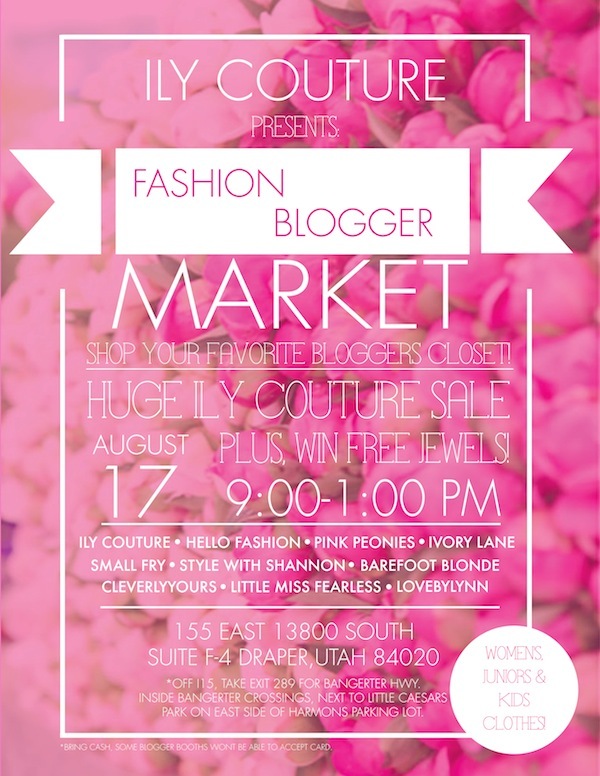 also, for you local utah girls- i am teaming up with some awesome bloggers for ily couture's fashion blogger market where you can come shop our closets! definitely come check it out for some fun and shopping and make sure to stop by and say hi! How adorable are you?? From the front you can't even tell you're pregnant! What a doll! THIS is one of my favorite looks! You are rocking this girl! I am loving those jeans!! I loved destroyed denim especially when it has a BF jean fit. Hey Robyn! I'm loving following your blog! I'm 29 weeks today! With your jeans, are you still fitting in your usual size or are you wearing some sort of band? Just wondering :) I haven't tried jeans, just skirts and dresses. you rock any and every look. You have such a pretty smile. How do you keep your teeth so white? I'm so glad boyfriend jeans are a trend now! This one can stay!